Aldo Amenta suffered a debilitating spinal injury in a 2015 diving accident. 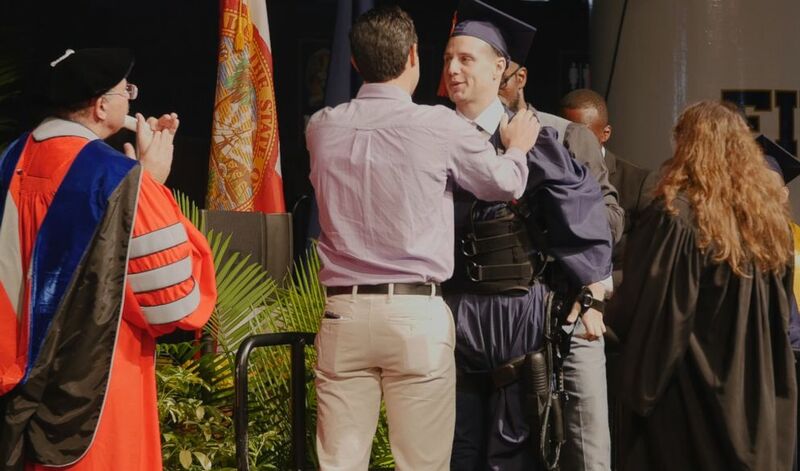 A South Florida college student who became confined to a wheelchair after suffering a debilitating spinal injury was able to walk during his graduation ceremony. 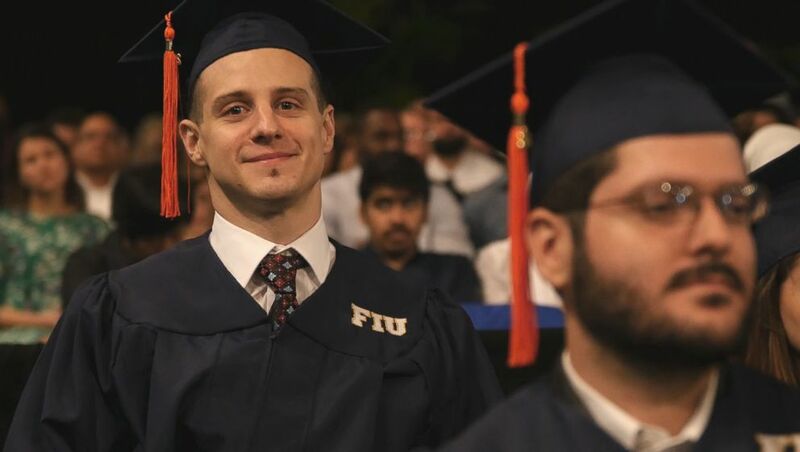 Venezuela native Aldo Amenta broke his neck when he dove into the shallow end of a swimming pool in 2015, he said in a video released by Florida International University. Doctors declared him a quadriplegic after the accident, he added. Amenta's life "changed completely" after he was paralyzed, he said. "Now, I depend on a lot of people to help me do my daily activities," he said. "So, that's become a huge challenge in just my everyday life." 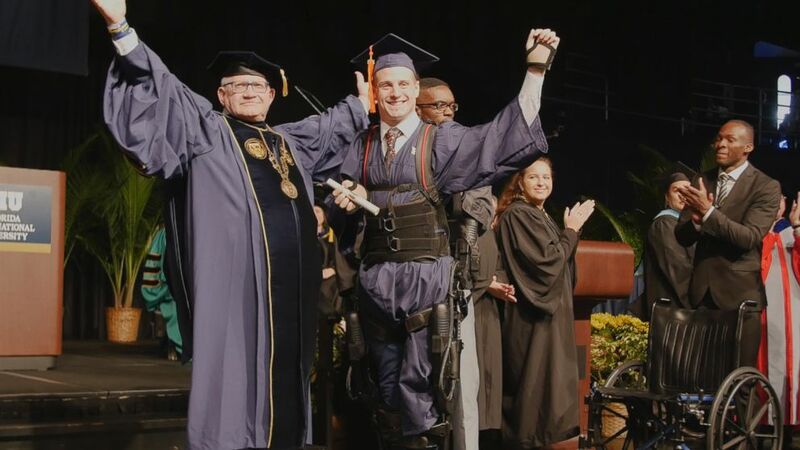 (FIU) Aldo Amenta used an exoskeleton to walk across the stage to get his diploma at Florida International University. The challenges were so difficult that Amenta considered dropping out of school, he said. But, with the help of his loved ones and a scholarship from the Miami-based university, Amenta was able to focus on his studies and eventually graduate, he said. On Sunday, Amenta, who has since regained some movement in his limbs, needed only a hoist out of his chair before he was able to take the steps on his own -- with the help of an exoskeleton on his legs and torso-- to retrieve his diploma. Amenta had to practice with the exoskeleton for several hours before he was able to perform the walk, ABC Miami affiliate WPLG reported. He graduate with a degree in electrical engineering, according to WPLG. Applause from the audience rang out as Amenta took each determined step across the stage, shaking hands with school administrators along the path, video shows. Amenta described the moment as "amazing," saying that the walk symbolized his ability to continue fulfilling his dreams despite the accident that changed the course of his life. The college graduate emphasized how perseverance allowed him to stay on track in achieving his goals. "It doesn't matter how hard you think things are going to be," he said. "Maybe you feel that it is impossible for you to make it, but you'll find people that are willing to help you...that motivated me. That gave me the strength to be able to continue to push myself through and stay positive." Next on Amenta's to-do list is to pursue a master's degree and to "keep on working on my rehabilitation, working for my dream to get back on my feet," he said.